Leading glass manufacturer and bottler, Encirc, has launched a new augmented reality (AR) offering for customers which uses cutting-edge technology to bring glass container designs to life. The innovative service means Encirc customers can view their glass packaging design concepts in real-world settings as well as move and amend them quickly. 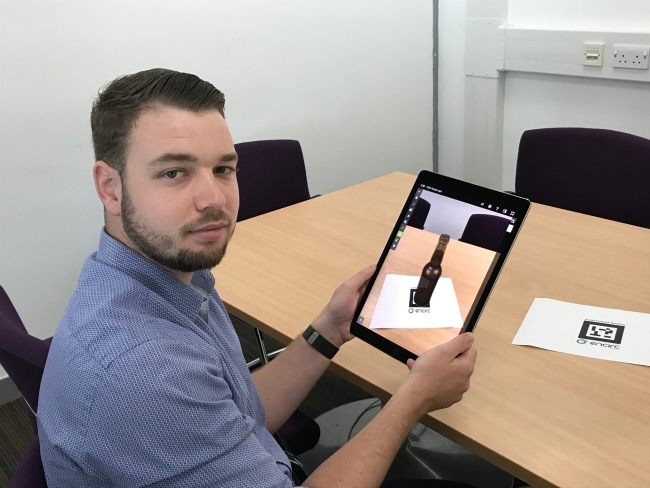 Encirc’s new AR technology service superimposes a computer-generated design onto a customer’s point of view via an iOS app on a tablet or smartphone. When compared to the typical method of 3D printing prototypes, this digitisation of the design process significantly increases the efficiency and speed at which Encirc’s customers’ products come to market. The new AR offering will build on Encirc’s current design options which already allow customers to create innovative and effective containers through the use of Computer Aided Design (CAD) technology. Combined, Encirc’s CAD and AR services will ensure the technical quality of the product is optimised, while the aesthetics still meet the desired requirements. A key challenge facing the glass manufacturing industry is developing lightweight containers, which are more sustainable and improve transport efficiency. Glass that’s too thin however, will not stand up to the manufacturing process and transportation, so rigorous testing is required. Typically the process for producing and testing a prototype container is around ten weeks. Using AR, Encirc can put container concepts through their paces using virtual reality stress tests. These deliver comparable results to real-life testing, but can be completed in approximately one week. By doing this, it allows Encirc to gain an accurate understanding of what will happen when glass prototypes are progressed to the trial stage, and therefore decrease the chance of re-trials. Streamlining the whole process is also more sustainable as it reduces the total amount of products used during the testing process. Rob Coates, Product and Graphic Designer, Encirc, commented: “Our design team is renowned for working closely with customers during the design stages, helping them create the perfect glass container for their brand and product. Rob Turvey, Sales Director, Encirc Glass, added: “We have a commitment to our customers to provide service levels of the highest quality. By listening closely to their needs and responding instantly to feedback, we can produce containers that not only suit their requirements, they visually impress end-users too.